As we grow in wisdom, we learn that being strong and courageous can sometimes mean sitting still….. Praying…. And, waiting. Being quiet. Trusting God while He works. We recognize that being strong and courageous in Christ is completely different than being strong and courageous in the ways our culture defines strength and courage. It’s counter-cultural. It’s not ego driven. It is not self satisfying. Sometimes showing strength & courage means standing up and defending ourselves and others, but never at the cost of another. Tearing someone down doesn’t make you strong. Neither does holding your tongue “to keep peace” when someone or their cause needs defending against a larger entity or when it means going against what’s popular. There are times when it’s much wiser to remain quiet, which takes a strength all it’s own, but we can trust that wisdom will tell us what battles are worth fighting with who and when. Getting our little one has been a fight from the very start, but I have learned that some battles are best fought on my knees. Praying and pleading. For my baby. My family. Their family. And, for whatever circumstances wherever they may be experiencing. One of my friends called her family her adopted child’s Plan B family. I never thought of it that way but how true it is. It is so true that God doesn’t desire families to be broken and children to be removed from their homes. It’s true that God doesn’t want His children living with life long soul aches because they can’t raise their children comfortably themselves. But, redemption stories are also true. How God can mend all of our broken hearts. How He can comfort our sorrows and turn our pains into opportunities that birth our greatest joys, opportunities for us to testify to His goodness & glorify His name. How these three or four separate entities can find peace and comfort in our Savior. The One, besides the baby, that unites us forever. It’s absolute truth that our Plan B story written by God is better than any top tier, Plan A story that could ever be written by anyone or any cohesive group of people. I think about how our Savior wasn’t God’s first, second, or even third choice when deciding how to bring His people back to Him…….. But, because of our sinful nature, His last option was the greatest option. I have wanted to give up. To say “this just may not be for us…” but I know that it’s God’s desire for us to care for a baby who is either unwanted or just cannot remain with their birth family for whatever reason. And, I can’t walk away from that. I’d prefer to wait in the balance knowing I’m doing God’s will than to walk away and experience temporary “peace” that will never truly be satisfying because of how the Holy Spirit will nag me and forever tap on my shoulder reminding me of what could have been and pushing me to obey anyway. I’m excited about the next steps in our process……. This week, I’ll be working on gathering our pictures so they’ll be ready to go in the next few weeks! I’m excited and literally sitting on the edge of my seat in anticipation about what God is going to do over the next few months! I truly believe that He is going to do something amazing through our lives and I am so ready for it!! He commands to not fear or be discouraged. No matter what the circumstances or what you face, The Lord YOUR God is with you wherever you may go. His presence is more valuable than anything we could ever purchase to protect us. Or, whatever comforts we feel could make us feel better. …. 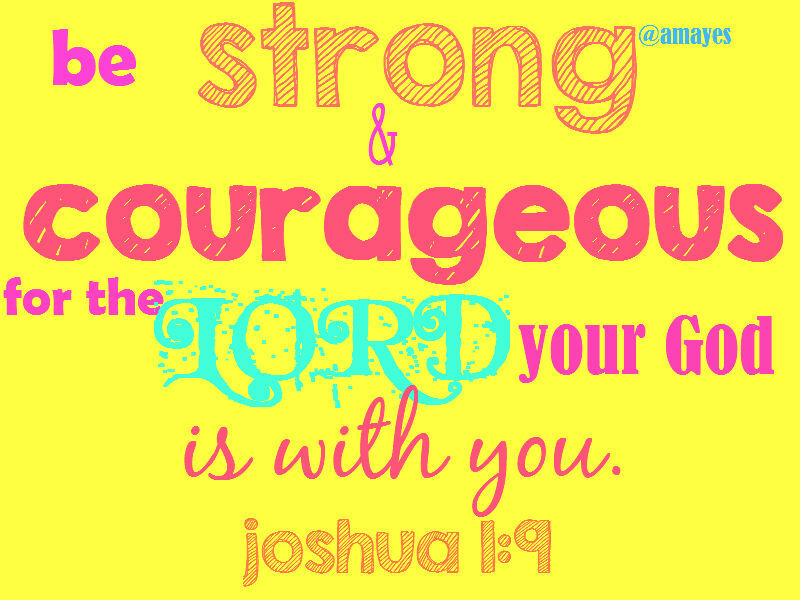 Here’s to a strength, peace, & courage that could only come from The Lord!